What is contamination and why is it a problem? Home » Bins at Home » What Can’t Go In Your Recycling Bin? Putting the right stuff in the right bin is important. The wrong stuff is called contamination and when contaminated loads of recycling are found, it can potentially result in the whole lorry full being sent for disposable instead of recycling. Norfolk’s recycling material is sorted by hand and baled by machine in a purpose-built factory in Costessey. So it’s really important to keep your recyclables Clean, Dry & Don’t Bag It. We know that these days everything seems to have at least one recycling symbol on it and that can make it confusing to understand what to put in your recycling bin. Check here to make sure you’re putting the right things in your Norfolk Recycling Bin. For further information on what all those symbols mean look here. Nappies – The box your disposable nappies come in is recyclable, but the nappies themselves, in Norfolk, are not. 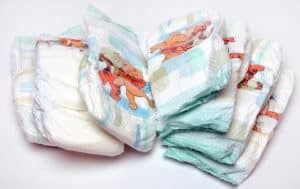 Nappies (used or unused) must not go in your recycling bin. They make otherwise clean recycling dirty and someone has to remove them by hand. Find out more on our page about nappies. Soft plastics – crisp packets, sweet wrappers, toothpaste tubes, carrier bags, food wrapping e.g. cellophane wrap round food punnets/trays, cling film, shrink wrap, bubble wrap and baby & pet food pouches. Some magazine wrappers (such as those from National Trust) can now be safely home composted, look out for the TUV Austria certification logo. If in doubt, check before you chuck using our BinGenie. Empty and rinse all containers and remember, all materials should be placed in your recycling bin Clean, Dry & Don’t Bag It. Clean – empty and rinse containers so they are free of food, drink or other residue. Dry – after rinsing, shake off excess water as liquids can make other things soggy and not fit for recycling. 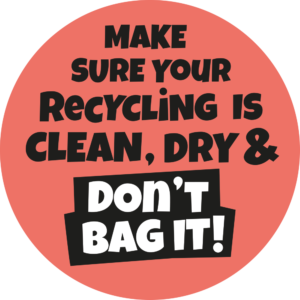 Don’t Bag It – different materials need to go in your bin loose. Please don’t put things in carrier bags, bin bags or boxes as they can’t be separated and recycled. Glass cookware and ovenware, drinking glasses or ceramics – although it may sound unusual, these items cannot be collected for recycling from your home. Use our Bin Genie to find your nearest recycling facility for these items. Cutlery, crockery, pots and pans cannot be recycled at home but can be taken to your local recycling facility. In extreme cases contamination causes an entire load of material, that was otherwise fine, to be rejected. The companies we sell our paper and card to send inspectors to check the quality of the material we are sending them. If they find food or a nappy in a bale of paper and card they will not accept any more of our material, until we pass future inspections. Paper and card that would have been going to them has to be sold to another company, which buys it at a lower price. All this means a loss of income which costs the councils and therefore you, the taxpayer, money. And that money could have been used on other services.